How many times have I taken you home with me since I started blogging? No matter, it seems you enjoy our trips, so here we go again! I love taking you along via my photos and stories.........sharing the lovely part of England I call home, way down south in the county of Devon. Mid-May brought sunshine and clouds, thankfully no rain, and of course my favorite temperatures in the 60's - home sweet home. My town, Torquay, known as The Queen of the English Riviera, was once the premier seaside resort in the UK. Sadly, like most places where government has spent money unwisely, and those who govern are not always honest and forward thinking, the glow of prosperity has faded somewhat. However, there is no place like home - we all agree with that no matter where it may be - so here in these next few posts I'll share the lovely bits! Looking across the bay where the farmland rolls down to the sea. 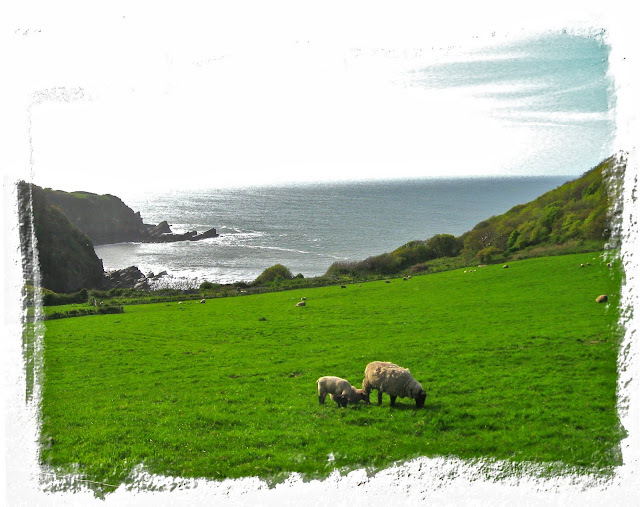 I love this about Devon - fields gently curve toward the cliff tops, below the sea sparkles clean and bright. Yes, more sheep, Devon being a rural county has plenty too - they're not all up north in the Lake District! At Torquay harbor, crab pots await the fishermen. To the left of the white pole, in the distance, is the building where I worked at my very first job, so long ago! ..........then chugged away to harbor where he would sell his catch to local restaurants. Yum, a fresh Tor Bay crab sandwich is hard to beat. 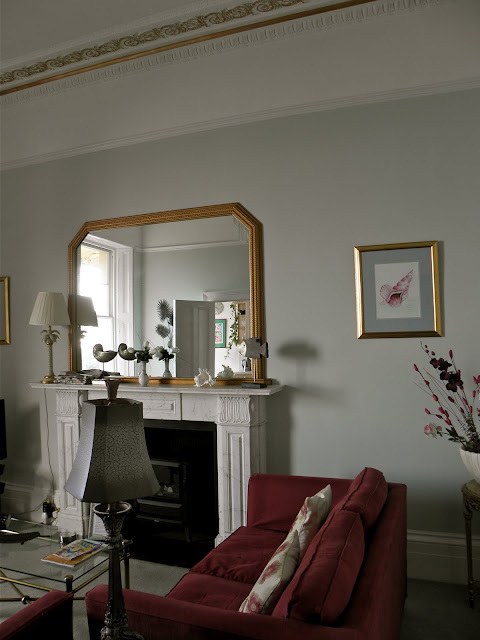 The beautiful Regency era crescent where we rent this flat when in town. (Photo taken from the ferry as we crossed the bay late afternoon). It sits above Meadfoot Beach looking directly across the bay to the English Channel and France. It's definitely a little home away from home - comfy, clean, and beautifully decorated......with that amazing view from four huge windows. The view toward Thatcher Rock when I stepped out on the small balcony. .......the beach at low tide - a little cafe stands next to the beach huts. This beach has not changed since my childhood days, thank goodness. Just a simple beach, a little off the beaten tourist track, only a minute from the flat. Swimming, snorkeling, when the water warms up around July, and sea bird watching - no huge crowds, no penny arcades, no tacky gift shops such as at some local beaches. Another view from the balcony - a tanker awaiting sailing orders in the English Channel. The center section of the crescent is a very nice hotel - this is their pool area viewed from our windows. Devon countryside in Spring - the ocean in the distance, aaah, perfect! Upcoming post - I'll share the story of bringing French delicacies to Devon..........and the chance of a visit to Normandy in the future! Could the grass be any greener or the water clearer? I can't imagine. Absolutely lovely! Beautiful photos of your hometown! What a lovely place to visit and live! I love that the buildings are right up to the water. And yes, that green! Gorgeous. That last photo of the Devon countryside in Spring is a real competition winner Mary. Hello Mary, It has been a dry spell since I visited you. I agree, there is no place like home. And sometimes home is where you hang your hat if even for a little time. Your photos of 'home' are lovely. One day I hope to visit beautiful England. I read your post about cleaning!!! Or you might say gardening and playing. I like the 'playing' part best. BIG smile. We are enjoying Maine so very much. New things to see and do is a good thing. We do have wifi in the RV park although it is slow, slow, and slower. Sigh. We lost it completely for 4 days last weekend because of weather. All is well now and so I am visiting today because it is rainy and fog. Actually, I am in the laundry room waiting for my laundry to finish. I have a new respect for my own laundry room after this experience. I am glad you took time to have some fun with Vanessa. Tell her hello for me. I definitely will be in Raleigh this Sept. for a week. Bill finally gave up his teaching job for good. I hope we can get together. Your photos are so crisp, especially the second photo of the water on the bay. I do not know what type of camera you use, but all your photos are outstanding. You live in a wonderful part of England. I hope it is cooler than here – we are in the mid to high 90s now. A lovely hometown. How wonderful to be able to visit and stay in the beautiful accommodations. You have me intrigued about crab sandwiches. I am wondering what is put into a good crab sandwich? Such beautiful photos! I can't wait to visit England later this year!! Such a beautiful hometown Mary! No wonder you miss it so much, that and France! Oh crab sandwiches, I miss a good crab sandwich, and the ones from your other post look delicious! I am so glad I clicked on this link! I loved every word, Mary. You are really stirring up my wanderlust! What I'd like to know is, what could possibly have lured you away from beautiful Devon all those years ago. All the beautiful photos make my heart sing! Hello Mary I've just found your lovely blog thanks to Shane in N.Z. ..Roses, Lace and Brocante. 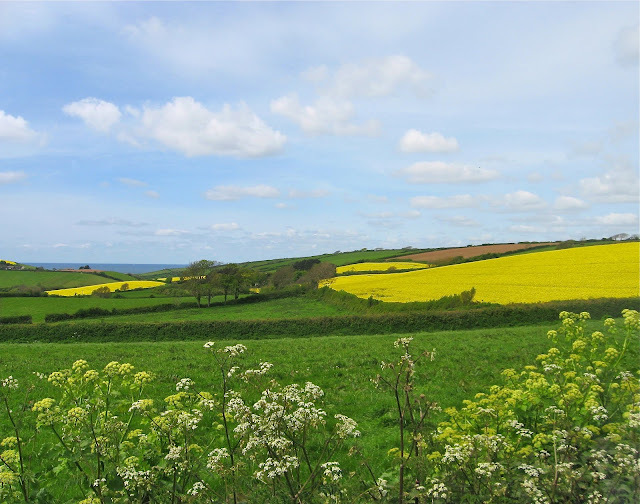 As soon as I saw the photo of the green fields.I thought of Devon where I lived in Dartmouth and then on Dartmoor for 20 yrs only a stones throw from Torquay where you had once lived. I loved shopping there. What a small world it is.. I've just been reading your post Home - sweet -home enjoying taking a trip down memory lane so to speak. I'm off now to make the your Carrot & Raisin muffins Shane has just mentioned in her post. I will follow you as a friend. then I can enjoy more of your lovely posts. I met Shane this time last year on the Grow Your Blog Party. and since then we have become frequent chatting friends.